Plot: Rick Travis, deep space pilot for the Intergalactic Mining Corp., is knocked off course by a meteor storm and his ship spirals uncontrollably to the surface of a mystery planet. Thrown clear of the debris he is found in by some small children and later falls in and out of consciousness on the operating table and in a recovery ward. He notes his mouth has been filled by some strange ‘breathing apparatus’. Shock: The mouthpiece is a baby’s dummy. Rick has landed on a planet where the infants are the ‘adults’ and the adult’s are the children. His recovery is being undertaken on the children’s ward. Thoughts: Barry Clement’s last work for 2000AD passes itself off unremarkably as a solid piece of retro-Sci-fi Shock but not one that would pass muster today. As with Clement’s last protagonist, Pritchard the Poacher from FS 42, Rick Travis is a fairly anonymous hero and the reader is never invested in his fate. His journey through the tale is completely passive: he crashes without any attempt to avert disaster, he is rescued without drama while unconscious and he gains cognition of the adult / child switch without any peril or endangerment. Clement’s internal dialogue is somewhat mangled and lacking a unified voice, at once juncture he refers to the ‘driving proficiency test‘, at another he’s growling ‘some joker cut rough and landed me one‘. The saloon-bar Americana of the latter sit oddly with the formalism of the former. The art of Carlos Pino is it’s usual professional standard. The sci-fi is resolutely retro, our hero manfully square-jawed and the children a picture of Janet and John innocence. The spaceship does break in two in the most unconvincing of manners and a slight inconsistency in the strip occurs during Travis’ operation where adults (who would, of course, be infantile) appear to be conducting the procedure; but otherwise its a fine turn. The Future Shock and Prog 90 are illustrative of the change occurring in 2000AD around this period as Pino’s work stands out as very dated when compared to the artists around him (Belardinelli going weird in Flesh, McMahon’s bonkers’ turn on The Day The Law Died, Kevin O’Neil’s fantastic Volg war madness in Ro-Busters and Ezquerra’s iconic Strontium Dog) and the tale lacks any of the madness and boundary pushing that Mills, Wagner et al. were beginning to mine so profitably. Shock’d? : The children-are-adults reveal does come on a final half-page spread and is quite sweetly drawn with lots to amuse any young readers with nascent revenge fantasies about their parents; however a minutes pondering leaves one to conclude ‘so what?‘. Just as a viewer had better not ask too many questions about why Mindy is attracted to an undeveloped boy, albeit one in a man’s body, the Shock requires you don’t think too much over Travis’ predicament because he hasn’t really got one. As Kidd, from Robo-Hunter, was able to establish himself as an adult, although one subject to constant jokes about his infantile appearance, Travis surely would be able to show his alien hosts he is an elder of his species. In the meantime his peril is hoping he has an appetite for Farley’s Rusks and liquified food. Plot: As Earth scientists complete the first Time Machine they research candidates suitable to be test pilots. Eventually they settle on two candidates, Shelvin and Farren, with the latter being the first choice. Enraged at being passed over Shelvin doctors the food of Farren and takes his place on the mankind’s first time flight. He sets out on a trip 60 years into the future knowing his fame will be secured. Shock: Shelvin fame is secured, without proper shielding his trip to the future has aged him 60 years and Shelvin has become the first fatality of time travel. Thoughts: Mike Cruden’s fourth Future Shock is a pure delight in no small measure due to the series debut of maestro Massimo Belardinelli. 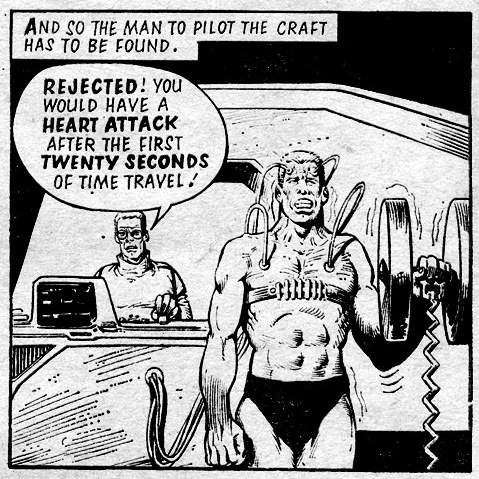 Belardinelli’s style moves effortlessly from comedy, a series of beefcakes failing the selection tests, to horror as the story ends on a magnificent full-page splash of Shelvin’s decomposed corpse slithering off the flight seat. 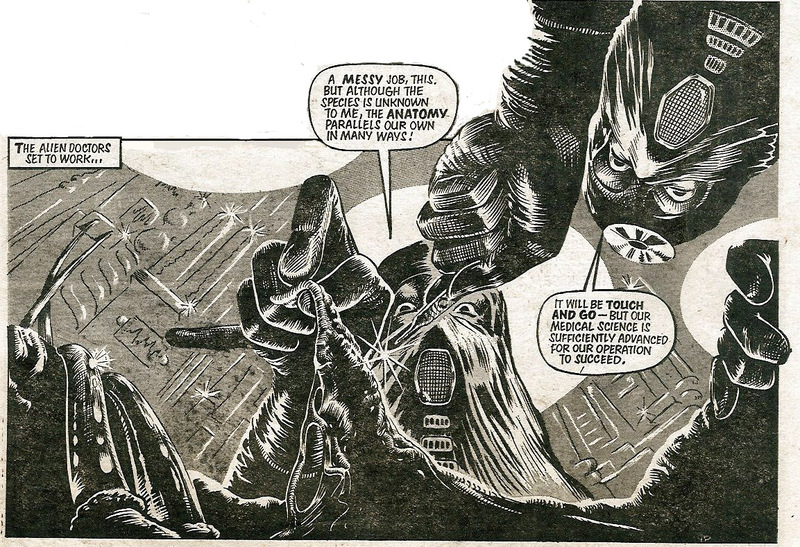 Belardinelli pulls no punches with a panel as magnificent as any from his years working for 2000AD. With bones exposed, flesh peeling off and collapsed eye-sockets a wafting stench filling the cockpit the image is both striking and horrific. Beyond the art the story is an odd mix of comedy, the first page of failed tests, drama, the doctoring of the food and awaiting the craft’s return, and horror. It is perfectly possible to image the script had more consistency of tone as none of the writing is deliberately funny or melodramatic but Belardinelli imbues each page with the different tones and lifts up the end product as a result. It remains a great shame this short three page Future Shock has never been reprinted. Shock’d? : The image is certainly shocking but in terms of scripting it is a bit random. That scientists manage to master the complexities of Time Travel but not notice a shielding issue till this juncture is so incredulous that the shock comes out of left-field. Without foreshadowing readers would assume such mundane considerations have long since been dealt with by the boffins. However the reader will have likely given little consideration of this due to the impact of the wonderful grotesque last page. Shock: Not only do the lasers seem real, they are real! They blast Chris’ chair and, as he reaches for the telephone to call the engineer, they blast his phone too. Later his father comes to call him for dinner, Chris’ lifeless body lies in front of the Fourth Wall. Thoughts: Mike Cruden and John Cooper team up again, after FS 21 (Prog 50, The Guardian) for another instalment of scaring the bejesus out of young boys everywhere with more tales of technology vs small child. Unlike The Guardian, where the nameless child was left to his impending doom, Chris is shown as a fresh smoking corpse, giving no doubt as to his fate in this gruesome Shock. Cooper’s art once again excels in drawing the boy’s face; in turn demanding, excited, in awe and scared. However, his decision to draw the TV images as vertical lines and white-space gives an odd effect to the strip and dominates over his traditional style in many panels. As a technique it doesn’t quite work and detracts from the beautifully balanced inks he uses to depict the rest of the family life and Chris’ demise. The twist in the story is formulaic but the use of the medium of television is a first for Future Shocks and the pacing is well scripted with an extended playing out of Chris’ scramble when the technology goes mad. Both story and art are above average, if not quite in the top-tier, and this successful Shock is definitely one of the nastier dark efforts to be presented to the young early-2000AD readers. Shock’d? : The focused nature of the story’s set-up: his mother complaining about Chris doing nothing but watching TV, the introduction of the new technology etc all means it is pretty clear what is coming; however that doesn’t detract from it being joyously executed and with a real impact on readers of Chris’ age. Plot: Professors Stein and Grahame enter a tomb that has been sealed for centuries. As they unsuccessfully try to open a ‘strange coffin shaped box‘ they quibble over whether its contents would prove that Earth had been visited by aliens or proof of a previously unknown tribe of humans. Turning their backs and continuing their academic squabble they fail to notice the sun has gone down and the coffin-shaped box opening.. Shock: A vampire emerges and moves in to devour them. Thoughts: FS 30, marked another 2000AD regular artist’s departure from the series with an even poorer story than FS29. SJ Grimes’ script has no logic to it whatsoever and can only be indulged by considering that its young readers must be very easily satisfied. Ramon Sola’s art is great and he draws a lovely menacing Nosferatu style vampire with balding head, bat-wing ears and powerful clawed hands; but the story is threadbare and confused. First of all the tomb is clearly Egyptian; hieroglyphs and Egyptian symbolism are littered liberally in the depictions inside and outside of the tomb. Given this, why two academics should be postulating that a coffin-like enclosure evidences either aliens, or more bizarrely ‘a tribe previously unknown to man‘ rather than, say, Egyptians is hard to grasp. Maybe this was Sola going off script and not knowing how to decorate a tomb but that seems unlikely. Having read the script he would hardly have decided to set it in Egypt when he knows a what would happen and a dank dirty cave would have sufficed. 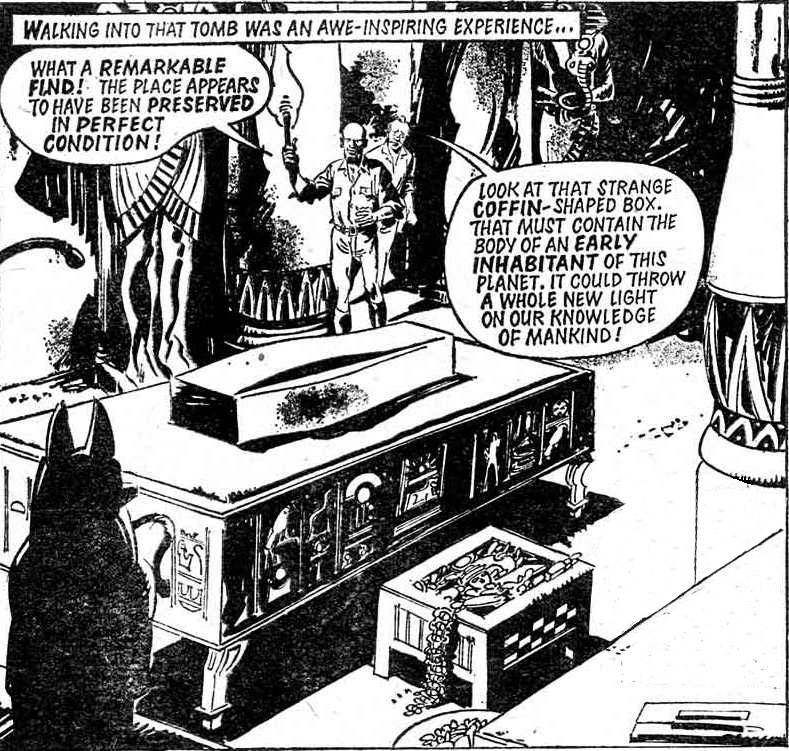 And this ties into the second key fault because, completely randomly, a vampire appears and the narration says ‘ but then the idea that the coffin was the home of a creature that could inhabit the surface of the earth only after the sun had set, was ridiculous‘. Yes, it is. However if anyone could envisage such it was probably Professors Stein and Grahame because they’re already squabbling about aliens and unknown tribes when surrounded by Egyptian artefacts. However the reader is left admiring Sola’s slavering ghoul and wondering where the hell it came from and what has it been doing in a tomb sealed off ‘for centuries‘. So poor is the story that’ SJ Grimes’, in his sole credit for 2000AD, may well stand for Alan Smithee. Shock’d? : The difference between ‘shock’ and ‘random disconnected deus ex machina‘ couldn’t be better evidenced than in this tale and it stands as an exemplar of how not to write a Future Shock.